The Many Benefits of Paragliding flight. Paragliding is human flight in its simplest and purest form. You launch by foot and can soar for hours on end and hundreds of kilometers with the right knowledge, experience and conditions. It is simple to learn, become certified and become addicted to the experience and all the benefits of paragliding. Simply put, if you have never been paragliding, you should go! A great number of people that do it for the first time will refer to it as a life-altering event at best and a great way to spend the day at worst. It does not matter if you are afraid of heights or do not own any paragliding equipment. 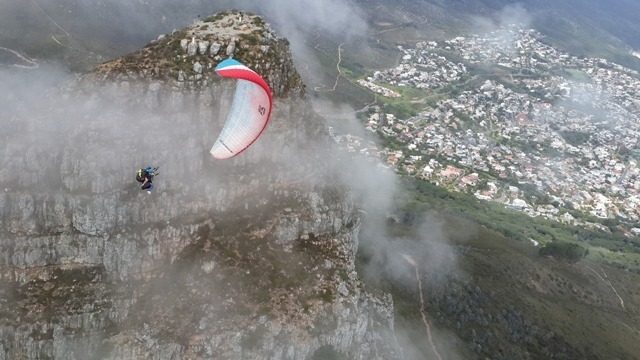 Even if you can only do it once while on holiday in Cape Town, the benefits of paragliding are many….. While paragliding from Signal Hill or Lions Head has many benefits, one is the ability to see Cape Town from a birds eye view. Even in an airplane, there is not a better way to see the area. The views are a complete 360-degree panoramic when paragliding and will give you a new perspective on the area, and the world as a whole if you have never been before. Many people find the view of Cape Town eye opening for many reasons. While the views themselves are spectacular, paragliding from Signal Hill or Lions Head will make you appreciate Mother Nature and what a beautiful place the world really is. Furthermore, it is extremely popular for paragliding passengers to chronicle their journey on video or still photography. This will provide you with a keepsake of your journey if you are only able to paraglide once, or you can turn videography while flying into a hobby as well. Do a simple Google search for paragliding and most of the results will be video submissions from amateurs and long-term enthusiasts alike. The peacefulness and serenity that can be found while paragliding are difficult to describe if you have never been. Perhaps some of that comes with the simplicity of the paragliding equipment that is used. All you need is a paraglider, gravity, wind, safety equipment and the power of the human body. Add a scenic location like Signal Hill or Lions Head in Cape Town, and it is a tough hobby to beat. Because there are no motors involved, and it is best to paraglide in wide-open spaces, it is a very quiet activity. Being alone, or with only a pilot in a tandem flight, with nothing between you and the ground but air is both thrilling and calming. You achieve a sense of freedom that is hard to find elsewhere. And the best way to know for yourself is to go out and experience it first hand. The launch off of Signal Hill is exhilarating as you propel your body forward and into the unknown. Then as you soar over Cape Town, the view and the overall experience of being out in the openness in flight will put you at ease.